In 2017, many growers are talking about a "botrytis vintage," but this wasn't the case at Hofgut Falkenstein, where I worked the harvest. The Webers avoided tilling the soil this year and don't use fertilizers—two measures that helped mitigate the increase of botrytis bunch rot. It also didn't rain much in the crucial period before and during the harvest, otherwise it would have been much more difficult to harvest healthy grapes. Yields were lower across the board in Germany as well as in France. Erich Weber said that this partly had to do with the cell division of the grape berry growth having been affected by stress from the previous year. On top of this, there was significant damage from spring frost, not to mention hail in different areas. At Falkenstein, a few plots below the Webers' press house, which are closer to the valley floor, are prone to frost and were affected by the extreme cold spell this past spring. Despite the low yields this vintage, the Webers are very pleased with the quality. Almost all the crop that ended up in the cellar has come from their various old-vine holdings, which tend to have tiny, loose grape bunches, with little or no botrytis. Johannes Weber was in the Scharzhofberg one day and said that most of the hillside was affected by botrytis, with many botrytis-affected grapes on the ground. While it might have rained more in this part of the valley, the cultivation and soil management of each producer also played a crucial role. In Egon Müller's case, the higher incidence of botrytized grapes likely has to do with tillage. His vineyard manager doesn't use herbicides, nor does he overcrop his vines. Besides, Müller has a market for wines with noble rot, even if this means a significant loss of crop and potential revenue. It was said to be even worse in other parts of the Saar and Middle Mosel. The Lower Mosel seems to have fared better this year. But I haven't spoken with other growers about the harvest. David Schildknecht published a vintage preview in Vinous on September 27, and Mosel Fine Wines will have a very thorough report in January. "Already in early August, some growers were correctly predicting that the crop would be high must weight and likely incorporate botrytis," David recently wrote me via email. "It seemed as though the vast majority of growers, who aren’t blessed with inherently/genetically loose clusters and irregular berries [specifically in reference to the Webers' vineyards], had compact clusters of uniform berries thanks to a flowering that was in retrospect too good. And naturally when rain came the seeds of botrytis were planted deep in those clusters." While it's true that the Webers have diverse plots with gentically loose clusters, it doesn't fully explain why their vineyards had less botrytis than other growers on the Saar, especially those with similar holdings in the same villages. The Webers also have vineyards planted with young vines or certain clones that they consider less good for their own cellar. Because they don't produce an entry-level wine, they hand-harvest and sell these grapes in bulk to the co-op, which is looked down upon by some more prestigious VDP estates. But why not? The co-op provides for the Webers an outlet for such crop. I should also mention that the border rows of a given parcel often have high vigor from too much nitrogen (leading to large, compact grapes and more susceptile to botrytis) because a neighboring vintner tilled or fertilized his or her vineyard too much. Likewise, the first few vines below a path or road often have more humus-rich soil, which also leads to darker leaves and bigger grapes. It usually takes a couple of years before the vines in a parcel that was taken over by the Webers to have balance and to be good enough for their cellar. The Webers also didn't have to wait for a team of pickers to arrive in early October, as was the case for many producers. Because of the early flowering and ripening this year, it made far more sense to start a week earlier, unless your grapes were still unripe due to higher yields. The must weights were lower than previous vintages at Falkenstein, even though the Webers tend to have higher ripeness levels from low yields (one flat cane per vine) and late picking. In Rheinhessen, top producers already began picking at the beginning of September and were done by October! I've read and heard producers say that leaf removal was necessary to create better airflow for healthy grape bunches. At Hofgut Falkenstein, the Webers only removed some of the leaves for Spätburgunder as a precaution against the Asian fruit fly, or Drosophila suzukii. They avoid removing leaves for Riesling, as it can thicken the grape skins and increase the phenolic content of the wine, including petrol flavors. From what I heard, Bischöfliche Weingüter Trier harvested its grapes in Wiltinger Kupp, Scharzhofberg, and other top sites by machine. It has done machine-harvesting in Falkensteiner Hofberg before. This large estate used a special steep-slope machine-harvester for Wiltinger Kupp and Scharzhofberg. This is less advanced than the more modern ones for less steep sites. But it's a shame that it would cut costs by machine-harvesting such choice parcels, especially those in the Scharzhofberg. In contrast, Reichsgraf von Kesselstatt chose to hand-harvest its young vines in Niedermenniger Herrenberg and the upper section of Krettnacher Euchariusberg this vintage. In earlier years, von Kesselstatt used a machine for these vineyards as well. But the trend is clearly moving to machine-harvesters when possible. Apropos a machine-harvester, another VDP Saar estate (which I won't reveal) used one to harvest numerous parcels. Many of the grapes didn't look very good either. In a different plot within the same vineyard, this producer hand-harvested the grapes and used an on-site sorting table. But this shouldn't be necessary if you have good grapes to begin with. Another VDP Saar estate buys for its entry-level wine the grapes from a producer in Krettnach that sprays herbicides and machine-harvests. It is hard to understand why certain VDP Saar estates, which are widely considered the best in the region, have failed to update some of their harvest equipment and winemaking processes, despite (in some cases) modern press houses. So many producers now use gray plastic pallet containers, such as from the firm Auer, that can be directly forklifted above the press, allowing the grapes to drop by gravity. This is so much gentler than grape trailers with pumps and easier to handle than green fiberglass containers that are not as hygienic as the pallet containers. But there are also grape trailers that can be tilted instead of having a mechanical screw and pump. The grapes at the bottom, however, are still under a lot of weight because of the large volume. Ideally, one has pallet containers, also called big boxes. These are about 600 liters in size. Even the co-op uses these. Some producers have smaller gray pallet containers. Most harvest teams have either plastic buckets or stackable 30-liter bins for harvesting the grapes. It may seem as if I'm picking on VDP estates, but it's telling how some of them have failed to make such basic changes to their approach, though there are members—Van Volxem, von Kesselstatt, or Knebel, to name a few—that use pallet containers. Von Kesselstatt modernized its press house at Schloss Marienlay and uses the smaller big boxes. On the Saar, there are a few producers who claim to do direct pressing with no crushing. But when I say "whole-bunch pressing," I mean without the use of a standard grape trailer, which entails pumping the grapes from the trailer into the press. Most winemakers, however, lightly crush and then press the grapes. The Webers picked the first Riesling on September 23 and finished the harvest on October 11. It should be another vintage that separates the wheat from the chaff in the Mosel Valley. Many big-name producers had problems with pero in 2016 and now with botrytis in 2017. Because of possbile off-flavors from botrytis and sour rot, most producers will fine their musts with charcoal. But the active carbon also removes good elements from the juice. This doesn't include all the unnecessary stress on the later wine that certain producers do from excessive pumping, fining (often with betonite), and filtering. Although it's too early to make quality judgements, the Webers might have an even better collection of wines in the 2017 vintage. The harvest went quickly and smoothly—three weeks instead of the usual four to six. In a normal vintage, we would still be harvesting grapes at the end of October. They also have, as mentioned above, all the best old-vine parcels in the cellar, including the new block of ungrafted vines in the place-name Im Kleinschock (see photo). It's the third complete block of ungrafted vines in their portfolio, along with one in the privileged Zuckerberg sector and the other in the heart of Euchariusberg—all three are highlighted on Clotten's 1868 Saar and Mosel map, with the Euchariusberg marked in dark red, indicating the highest rating. There should be several Kabinett trocken/feinherb casks, plus four Kabinett with more noticeable residual sugar. The acidity levels will, once again, be high but ripe and not too sharp—perhaps even a little milder than previous vintages. A wine critic recently asked me why the Webers don't use a harvesting machine for the grapes destined for the co-op. The Webers find it less flexible, and there's not much of a cost difference for them. Their small harvest team consists mostly of friends, neighbors, and those living in nearby villages. They also don't have many sturdy trellis systems on wires that would hold up to the stress of such heavy machinery. Below are some notes that I wrote down for a few harvest days. 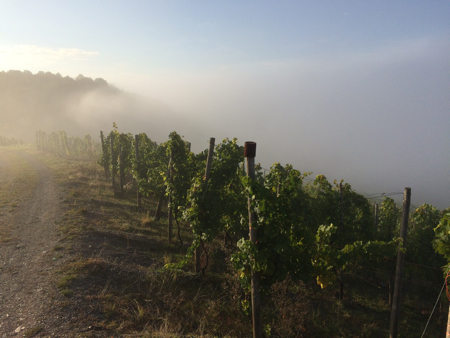 Sept. 26: We picked the new block of ungrafted vines in the place-name Im Kleinschock today. On Clotten's Saar and Mosel map, it is designated as Schock; the place-name Großschock is listed under Euchariusberg (see "Tranchot Map" for more on this). We began harvesting Riesling for our own production on Saturday. So far, we have four casks of Riesling, plus one Weissburgunder, which was the first juice to be pressed in the cellar this year. Oct. 2: We harvested plots in the Zuckerberg and Langenberg sectors, which are located on the eastern flank of the main Niedermenniger Herrenberg hillside. Despite the very low yields this vintage and the rain last Saturday, we are very pleased with the quality so far. Almost all the crop for the cellar has been from old vines that have tiny, loose grapes bunches, with little or no botrytis. Oct. 11: We finished the harvest today and picked the last plots of Riesling yesterday. The different casks range from 81 to 97 degrees Oechsle. The latter was harvested in Großschock a few days ago. It was mostly young vines and the only one with a significant amount of botrytis. The next highest must weight was 92 degrees, which comes from some of their top old-vine parcels in Euchariusberg. Most of the Riesling, however, measured below 90. We are extremely happy about the quality of the grapes. Yesterday, we picked on the next to last day beautiful, small, golden, loose grape bunches in Krettnacher Ober Schäfershaus (a registered place-name in the best section of Altenberg). The must weight was 90 degrees Oechsle. On the same day, the steep west-facing plot in Oberemmeler Karlsberg had picture-perfect Riesling at 85 degrees. Photo of a plot of ungrafted, old vines in the place-name Im Kleinschock on September 26, 2017. The backside of the original Euchariusberg is peaking out in the background.